In the first step of LASIK surgery, a thin flap is made in the flat surface of the eye, known as the cornea. The flap is made in either one of two ways: your optometrist will use either a metal instrument called a microkeratome or an Intralase laser using the energy from ultraviolet beam. In the second step, your surgeon will then fold back the flap and precisely reshape the corneal tissue with what is called an excimer laser. In the final step, the flap is repositioned over the cornea, serving as a bandage. LASIK surgery improves your vision during the second step, during which the laser remodels the cornea’s shape. During this process, the cornea is reshaped allowing more light to enter the eye and the retina, resulting in sharper vision. Your surgeon will flatten the too-steep cornea if you are nearsighted, and shape your cornea into a steeper shape if you are farsighted. Your surgeon can even reshape the eye if you have astigmatism. 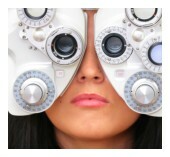 LASIK has a high patient satisfaction rating that is linked to low pain association. The surgery is performed along with results as early as the next day. As prior to any surgery, one of our eye doctors will perform a comprehensive eye exam to determine if your eyes are healthy enough for the procedure and to determine how much laser reshaping would be necessary for optimal vision correction. If you live in or around Dallas, feel free to contact our office and schedule an appointment for a consultation today to discuss how to best improve your vision.